Samsung has been recently introducing new features to compete with other service providers. The latest is its own music streaming service called the Samsung Milk. 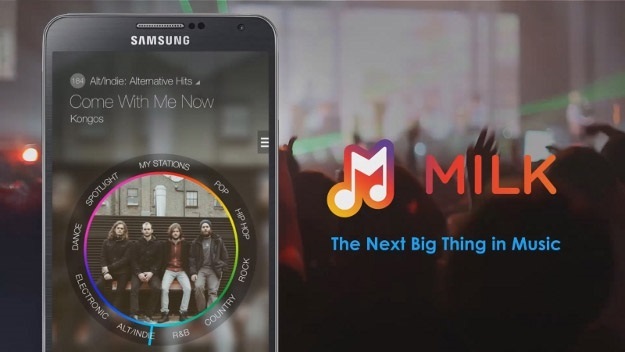 Samsung has announced the launch of its own music streaming service called the Samsung Milk Music with an intention to replace popular services like Pandora, Rdio etc. to add to it, unlike most of the other services, Milk is said to be completely ad-free. You are however limited to six skips an hour on any given station. The Samsung Milk Music has a simple UI with a large dial which lists nine genres. After turning the dial to select the genre, you can select the available station based on new music, popular music or music you’ve favourite in the past. There is also a Spotlight section which has curated suggestions from music tastemakers and influencers. The Samsung Milk app is currently available only for the Galaxy S5, Galaxy S4, Galaxy S4 Mini, Galaxy S III, Galaxy Note 3 and the Galaxy Note II. It is however expected to be expanded to support more Android device but could be limited to the Galaxy series for a while. The app can be downloaded from the Google Play store for compatible devices.